Answer - Ideally, early morning! This is the time when oxygen level in the atmosphere around us is the highest (particularly in urban areas). Air and noise pollution levels are not high. If you exercise outdoors, the sun rays help to produce vitamin D which is essential for good health. You are most fresh in the morning after a night's sleep. Your stomach is not filled with food. One aspect of your good health regimen is taken care of and you won't need to worry about finding time for exercise the rest of your hectic day. 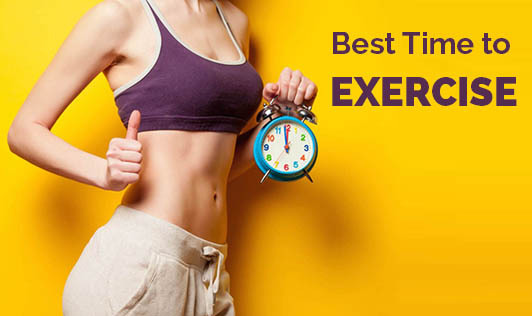 However, if early morning exercise is not practical for you, any other time of the day is also fine as long as you keep aside a minimum of 30 minutes for exercise. If you exercise later in the day, make sure your stomach is not full. It would be an added benefit if there's minimal air and noise pollution around you. Also try to get at least 15 to 20 minutes of sunlight on your skin either during exercise or any other time of day.